As in past years when I’ve covered the EYBL, I’m always impressed by the format and organization – it’s a fantastic chance to scout many of the top recruits in a single location. This year the big draws were Harry Giles and Jayson Tatum, the #1 and #2 players in the 2016 class respectively. I didn’t get a chance to catch as many games as I wanted (this is always the case) but nonetheless, here are my notes from the 2015 event. Where applicable, I’m also including my actual ratings for players – as most people are aware, I am not a big fan of rankings, but rather I focus on ratings, and that means ratings beyond just ‘five stars’ or ‘three stars’. I’ll be posting much more about my rating system this week. For now, just know that ‘high major’, ‘mid major’ and ‘low major’ are the breakouts of Division I, and that I consider a player who is a ‘HM/5’ to be almost a lock for the NBA and the scale goes down from there. So players who are three or four year players at a high major school and may be NBA players tend to fall into the HM/4 or even HM/3 range. I also don’t consider every school in the ACC or SEC to be equal and I don’t consider every player on a high major roster to be HM rated players. As recent examples, I had Kyrie Irving rated as HM/5, Anthony Davis rated as HM/5 and James Michael McAdoo rated as HM/4, because I was less sure McAdoo was a pro prospect. Schools like Duke, Kentucky and UNC are generally only looking for HM/3, HM/4 or HM/5 level players. Some additional notes are: I never rate a player publicly unless I’ve seen him a minimum of 3 times; I rate players based on their actual age as well. I pay ZERO attention to who has offered a player. Harry Giles (PF/C, 6’10”, 2016) CP3 All-Stars – Even though I’ve seen Giles many times over the years I haven’t written much publicly because he never needed the exposure. But Giles has become one of the best high school players I’ve ever seen. He’s fluid and quick with elite athleticism and size. Even as a freshman, he had a pro level slashing move and finish hook, but now he’s expanded that first step so it’s extremely difficult for big men to stay in front of him. His handle is more like a small forward and he has elite timing. It’s no secret he’s considered an NBA lottery pick. Areas for improvement might be continuing to add strength for the pro game and free throw consistency, but it should be noted how much work Giles has done after his injury to improve on his already solid skill set. Rating: HM/5. Travis Atson (SG, 6’5, 2016) PSA Cardinals – Atson is a dynamic playmaker from the wing who looks like he could play from the SG or SF spot effectively. Quick, active player who has excellent passing vision from the wing and good look-ahead passing. Can finish above the rim, shoot, and get himself to the line. Tough player who looks like he is mentally and physically ready for college. Jordan Ford (PG, 6′, 2016) Oakland Soldiers – Elite speed guard, deadly end-to-end scorer who can and does blow by people. he can run the point but is so effective at getting inside or getting open for shots that he should be considered a score-first PG. Deadly floater and finisher. Ira Lee (F, 6’9″, 2017) Oakland Soldiers – above the rim, active athlete and has a nice running floater that is hard to stop at his size. Plays facing the basket and probably should be considered a 3/4 type player depending on the size of the opposition. Excellent bounce and timing. Cyril Langevine (C, 6’8″, 2016) NJ Playaz – still a bit raw but a lot to like in a post player with good strength already and a frame that looks like he will be a beast once he gets to college. Decent shot blocker but his timing needs a bit of work. Good hands. Charles O’ Bannon (SG, 6’5″, 2017) Las Vegas Prospects – O’Bannon is a high level scoring guard who is a bucket getter, and in multiple ways. A solid scoring option no matter whether he’s in the half court or transition, has excellent pull up on the move, can easily create his own shot. Squares up well and is consistent even from mid range. Problem for defenses and is the type of player who can drive opposing coaches crazy even with good defense. 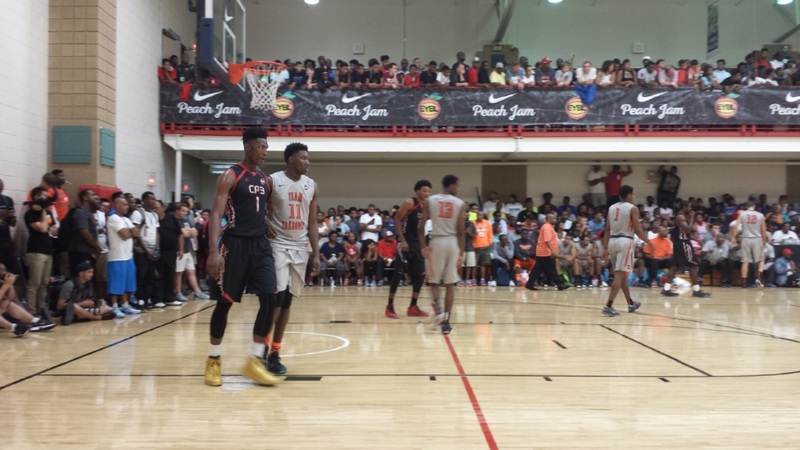 Lonnie Walker (SG, 6’5″, 2017) Team Final – Walker is a solid, big time scoring guard with high major size and ability. He can score both slashing to the basket and with the deep shot, and he can finish in traffic with his agility. As a 2017 player, I expect him to be a significant pick up for a high major school. Samuel Japhet-Mathias (C, 6’11”, 2017) PSA Cardinals – Pure center with soft hands and big space-eating physique. Physically imposing and makes it very tough to score in the paint with his size. A half court style big man with potential. Marques Bolden (C, 6’11, 2016) Pure center with decent poise and polish in the paint. Good hands and has a very good up-and-under move to finish. Does pass out of the double team when it comes but made multiple turnovers when doing so. Half court style player. Does box out very well. He is a solid big man at the Division I level but I will have to watch him a lot more to see if he’s worthy of the high rankings that have been given him – I just didn’t see enough during this tournament to accurately judge. Paul Washington II (F, 6’7″, 2017) Team Penny – athletic forward who can be dominant around the rim at times with his explosiveness. Bigger, slower post players have trouble staying in front of him because of his athleticism, but he’s not really a pure post player at all. Grant Williams (PF, 6’8″, 2016) CP3 – Williams is a guy I’ve written about before and I love the physical presence he brings to the game. He is a big player – about 250 lbs – but has bounce, nimbleness and shot blocking that allows him to play either at the 4 or 5 spot. His shot blocking is excellent and he has that coveted timing that translates to every level – he gets putback buckets by the handful and is one of the key guys that can clean up when a team’s shots aren’t falling from the perimeter. Not ready to make an assessment on Williams but he’s definitely a Division I big man. Andrew Jones (SG, 6’4″, 2016) Pro Skills Elite – scorer who is a high motor, high octane wing and can run some point but is really effective as a passer or scorer from the wing. Made a lot of nice plays on the offensive end but was very effective and disruptive in the defensive passing lanes. Alterique Gilbert (PG, 6’1″, 2016) CP3 – Gilbert is an excellent, poised guard with a deft handle and a true PG who runs the offense, I like where he is always looking to go with the pass and doesn’t over dribble. However, even with all of that, what really impressed me about Gilbert was his defense – he has elite lateral quickness on defense and he uses it. Vaughn Covington (PG, 6′, 2016) Team Final – vocal point guard who is a gamer, gets into opponents’ heads and can drop big time deep shots. Has a toughness about him. Derrick Funderburk (F, 6’9″, 2016) King James Shooting Stars – Thin but incredibly agile forward with great length. Really a prospect that should be watched – has a good handle from the PF spot and elite athleticism/size. Funderburk is committed to Ohio State and he’s going to be a big time get for them. Lamar Stevens (PF, 6’7″, 2016) Team Final – Stevens is a physical, powerful and athletic post player who was a major factor in his team’s win over Harry Giles and CP3 during pool play. To be blunt, Stevens matched up defensively very well with Giles because he is one of the few players I’ve seen with the athleticism and size to deal with him. However, as good as Stevens looked against CP3, he was not a factor later in the day and I do wonder if he was dealing with fatigue. Stevens’ performances are exactly why I never rate guys until I’ve seen enough. I will definitely watch him multiple times this season, as his first performance looked incredible. Henry Baddley (SF, 6’5″, 2016) King James Shooting Stars – I really love Baddley’s game because he’s a beast from the perimeter – did show an ability to drop the deep shot but he’s a physical bruiser who attacks from the wing with power. Jordan Tucker (SF, 6’8″, 2017) NY Lightning – has a textbook jumper, and at 6’8″ his high release is extremely difficult to guard. Moves well without the ball but at least when I saw him in this tournament he seemed to struggle with consistency and wasn’t creating his own shot as much as moving to the open wing off of curls. Carlos Johnson (G/F, 6’5″, 2016) Oakland Soldiers – power guard who bangs hard and is a bruiser at the rim. Goes up for putbacks or dunks and tries to two-hand slam everything he can. Versatile and strong. Markus Howard (PG, 5’11”, 2017) Las Vegas Prospects – Howard fits the mold of the type of PG who rarely makes bad plays, but then as the game progresses, starts burning the defense with his deep shot and consistency. The type of guard who doesn’t miss transition layups and you can’t leave open on the perimeter. Dylan Painter (C, 6’9″, 2016) Team Final – I had the opposite experience watching Painter as I did with his teammate Lamar Stevens. Where Stevens looked great in his early game but faded in the second, Painter struggled against CP3 but looked like a monster in his second game on the same day. Showed excellent rebounding timing and shot blocking, and one thing he did in every game I saw him was a a consistent two-hand tomahawk on the move or catch. Elijah Pemberton (SG, 6’4″, 2016) NY Lightning – Good scorer and finisher and not the type of player to leave open on the perimeter – active on both ends and worked hard; at times when I watched the Lightning they seemed to go through periods of scoring difficulty and Pemberton was the only player who consistently attacked; can also create his own shot. Schnider Herard (C, 6’10”, 2016) Proskills Elite – Excellent strength, size and awareness in the post. Looks like he could blow up with a good big man coach; can be sometimes taken out of the play and is a half court type center, but definitely not a big stiff and has great post size. Michael Diggins (SF, 6’6″, 2016) Las Vegas Prospects – Diggins is slender and has eye-popping bounce and a fluid slashing ability. Needs to add strength but as he does I would expect him to rocket up in the ratings and he’s definitely the type of impact athlete for college. Jayden Hardaway (G, 6′, 2017) Team Penny – excellent scorer and is the type of player who knows how to get his points within the team offense – kind of a silent killer, never looks like he’s forcing shots but will have 20+ points at the end of the game. Nice quick release on the move as well. Nazeer Bostick (SG, 6’4″, 2016) Team Final – very fluid slashing wing with size and really knows how to play off of the ball in the backcourt. Collegiate size at the off guard spot and scoring. Next storyBasketball Scouting: What is a ‘High Major’ recruit?